Te Araroa can't be hiked year round – well I guess if you don’t mind lots of rain and snow as well as freezing temperatures it might be possible but surely that's nothing for me. New Zealand is south of the equator so spring starts around September. That’s when I want to set off in Cape Reinga, heading south-bound (so called SOBO-hike) Temperatures will still be rather cold but feasible. I hope that most of the snow will be gone by the time I hit the first mountains on the Tongariro Alpine Crossing on the North Island as well as later on in the mountain ranges on the South Island. Arrival in Bluff, if everything works out as planned is five months later. With the rough time frame set, the detailed planning starts and, among many other things to consider, consists of booking the flights, getting a visa, reading the trail notes and blogs to get an idea of the sections: what kind of terrain can I expect, where can I camp, are there any huts to stay at, where can I resupply, etc. To work and back - for one year - everyday. But to be honest not that much hiking with my (heavy backpack). That will be training by doing. The North Island consists of muddy forest sections, lots of road walking and, apart from a few exceptions, plenty of towns to resupply. The south on the other hand is rather remote. Rocky, exposed terrain and long stretches without any possibility to buy food. There is, however, the possibility to send ahead food boxes, something I do 4 times mainly on the South Island. Te Araroa has many river and alpine crossings, which makes the hike extremely dependent from weather (rain, snow, wind, visibility,...) and therefore prone for delays. So it's essential to carry extra food in case you get stuck due to weather. With this food drops, +/- ten days will be the maximum number of consecutive days I will have to carry food for. 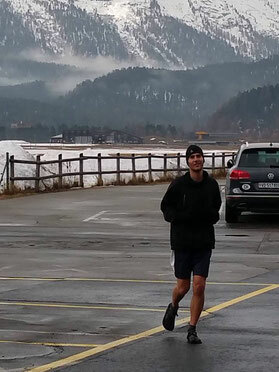 When in Switzerland, I'm living vegan, which is difficult to keep up on the trail. Therefore, as on my recent trips, I'll strech "the rules" now and then (I think that's called Flexitarian). Meaning if I get invited for lunch or dinner or if someone is offering me food, I will of course not say no just because there is meet or dairy in it. Same with resupplying: If no suitable vegan products are available, I won't have problems to fall back on other products. Apart from a very few parts, water is usually not an issue, as long as you carry a water filter. On the South Island, huts are scattered all along the trail. With a very affordable Hut Pass that you can buy in advance and allows you to stay in most huts for "free", I will use the huts whenever possible. The trail notes are an excellent resource for places to stay and resuply. I marked some of these places on Google Maps to have a better overview. The cart for example stands for resupply, the burger for limited resupply or a restaurant/fast food/bakery. The green tables are campsites, the yellow beds hostels or huts. It's my no means complete, but I guess for an overview sufficent. I did a similar thing on a foldable map, which I will carry with me on the hike. Beside the high cost, it just takes lots of time to find the right gear (only to realize that it’s not available in Europe…). Reading countless of reviews and browsing through websites as well as local outdoor stores I bought the gear that will hopefully prove successful. But although trying to save weight wherever possible, my pack weights way more than the ones of Ultra Light Weigh hikers. My DSLR alone is half the weight of their pack. I try to walk as much as possible in my Luna Sandals. 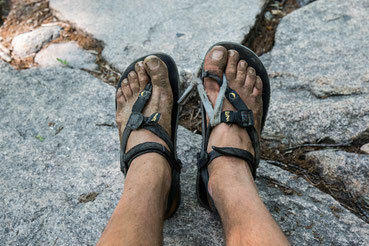 When I first used sandals on my hikes 2 years ago, it was love at first "wear". Mostly very good grip, no sweaty feet, no blisters so far (which I basically always got when hiking with boots) and, if you take it slow quite safe - even in mountainous terrain like the one that will expect me on the South Island. And should the temperatures drop below 5 degrees Celsius, Injini socks and the Tabu will keep my feet warm. 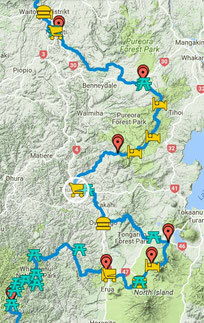 However, especially the mud in the north and possible snowfields will be challenging. Mud, respectively snow then usually sticks between the sandal and the food, making it either extremely slippery (mud) or uncomfortably cold (snow). In my opinion the two main weak points of the Luna. Also I have to make sure, the skin at the heel won't rip. Usually happens when cold and dry (...Engadin... ;). One unknown: How will my feet and ankles cope with the additional weight of the pack? We will see how it turns out. But I'm ¨confident. Primary navigation will be following the orange markers. As additional nav aids I will use printed out maps and trail notes, compass and my Cat S30 phone. With downloaded topo maps it can be use as GPS.